Graceful flowing lines, clean looks and robust engine combine to give the Vulcan® 900 Classic an appeal that will charm a wide variety of riders, from new students of the motorcycling life, to experienced veterans seeking a practical and stylish cruiser. After all, what’s not to love about a motorcycle that offers the look and feel of a larger V-twin, minus the steep price and extra bulk? It’s a win-win for 900 Classic owners; they get a fuel-injected 903cc engine which delivers exceptional roll-on acceleration and a nimble chassis with classic cruiser style. This Vulcan’s winning combo will please entry-level riders and anyone seeking class leading power and torque, but wanting more agility than a large-displacement machine. Blessed with plenty of charisma and class-leading ergonomics, the Vulcan 900 matches its powerplant and chassis prowess with equally stunning bodywork. Graceful fenders and fuel tank accentuated by a polished chrome-accented air cleaner and chrome headlight give it the classic cruiser curves. A subtle matte black frame balances the stylish modern flair in its bodywork, low-slung seat, and stylish tail light. 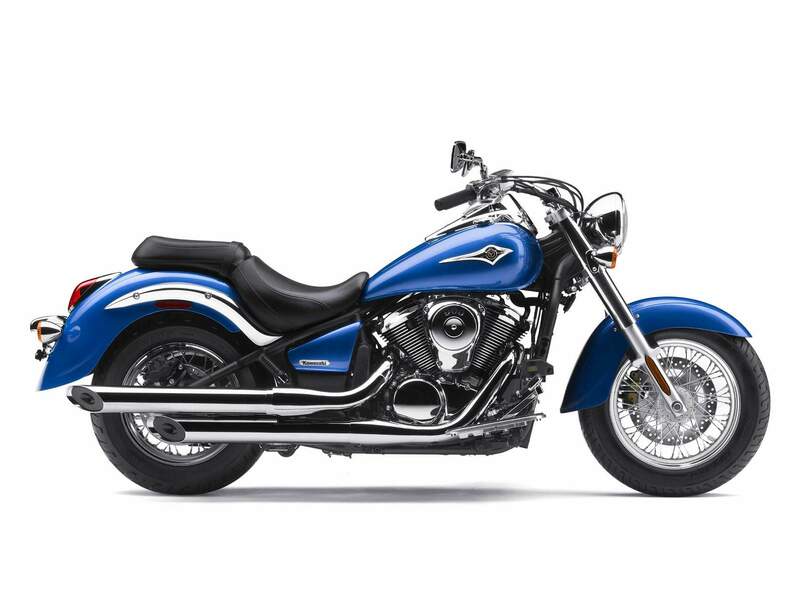 Keeping with its cruiser roots, the visual treats continue with curved engine fins on the big, V-twin that features ride-enhancing, modern touches inside – four valves per cylinder performance, liquid-cooling reliability, and a vibration-reducing engine counter-balancer. A belt drive on the Vulcan 900 keeps the overall weight down, improves rear-end styling and provides the rider with additional customizing opportunities. A single-pin crankshaft, which helps produce that distinctive guttural, classic V-twin sound, and the beefy rear tire, the largest in its class, contributes to the Vulcan 900’s big bike feel. The Vulcan 900’s low seat height and tapered seat doesn’t exclude any rider. Comfortable enough for any distance, the front bucket seat flows nicely into the largest capacity fuel tank in its class, and lower chassis rails provide a narrowed shape for an effortless reach to the pavement – ideal for shorter riders. The rear pillion pad makes it painless to share the two-wheeled experience. The wide handlebars, seat and floorboards combination offers an ideal ergonomic relationship, making for a relaxing mount. Some of the other features that make the Vulcan 900 appealing to such a wide audience are a fork offset and rake designed for light, effortless maneuvering at low, in-town speeds. The 900 Classic is equipped with an auto-fast idle system that uses an rpm feedback relay to ensure a fixed engine speed in all starting conditions. Its easy-to-control fuel-injection makes ultra-low speed riding surprisingly easy, and the abundant low-rpm torque provides thrilling roll-on acceleration. At home, around town or on the open road, this motorcycle is built for hour upon hour of riding pleasure.